Dreaming of a romantic seaside wedding in Italy? Get married on the Amalfi Coast, in the Southern Italian region of Campania, the most perfect and enchanting location for an outdoor seaside wedding in Italy. 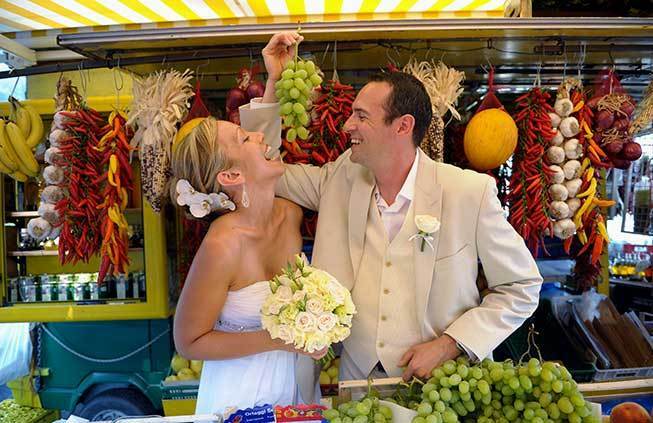 Choosing a reliable Italian wedding planner for your destination wedding in Italy is very important. 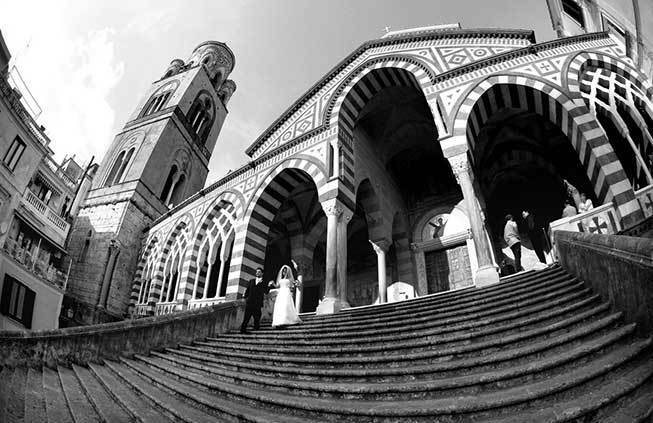 Weddings on the Amalfi Coast is supervised by Exclusive Italy, the leading expert on Amalfi Coast Weddings. At Exclusive Italy our experienced wedding professionals can help you to create a truly magical Amalfi Coast, Sorrento wedding suited to your needs and budget. How do you want to get married? 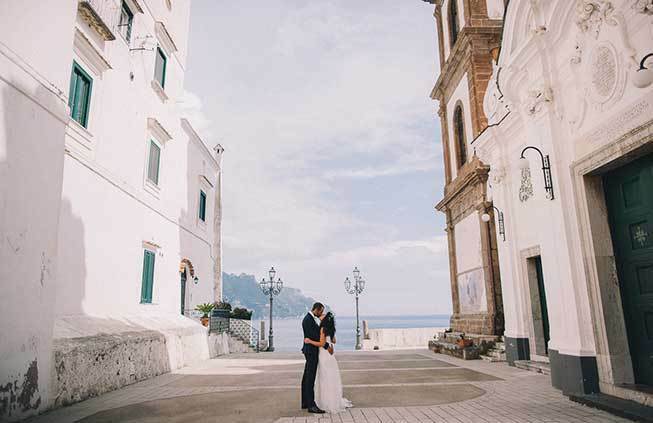 We can provide you with inside advice on where to plan civil, catholic, protestant, jewish, non-denominational, symbolic, vows renewal and blessing ceremonies in the beautiful villages of Amalfi, Positano, Ravello, Atrani, Sorrento and Capri. A wide list of venues is available at Weddings on the Amalfi Coast for romantic wedding receptions, from the finest luxurious hotels, private villas for Mediterranean wedding receptions, delightful panoramic restaurants overlooking the sea to private terraces enjoying spectacular vistas. The Amalfi Coast is located south of Naples in the region of Campania. 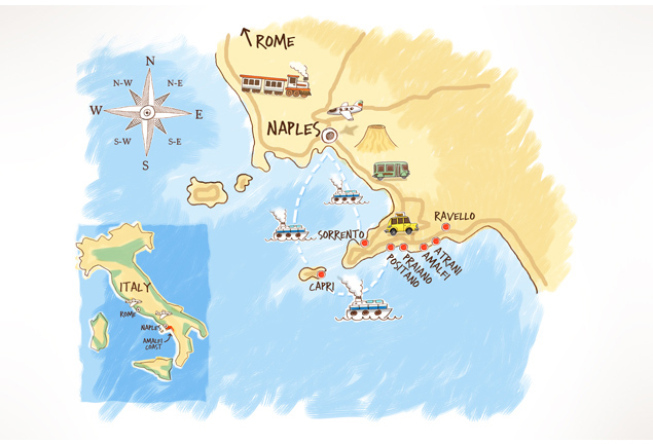 The nearest airports are in Naples (Capodichino), which is 75 km from Amalfi, and in Rome, 300 km from Amalfi. Roma Fiumicino is the major Italian airport and has the most international connections, Capodichino has also many connections, some low cost companies are based in Roma Ciampino. The Central Station in Naples is connected through high speed rails to the main Italian cities (Milan, Florence, Rome), the fastest trains are called FrecciaRossa (they are also the most expensive). In Rome these trains depart from Roma Tiburtina or Roma Termini and reach Naples in about 1 hour. Intercity trains are cheaper and take about two hours to reach Naples. Local trains are the cheapest but they stop at every little station and therefore take 4 hours. Once arrived at the Central Station in Naples you can reach Sorrento in one hour with the local train Circumvesuviana and then continue by bus to your destination on the Amalfi Coast. From Roma Tiburtina Station you can take a bus that goes directly to Sorrento, Positano and Amalfi in about 5 hours. A bus that links Napoli to Amalfi in 2 hours stops near Napoli Centrale Station (the bus stop is 400 metres away). A bus departing from Capodichino Airport reaches Sorrento in 90 minutes. All destinations on the Amalfi Coast are connected by local buses. Before deciding to travel by car to the Amalfi Coast please consider that roads here are narrow and curvy, and there is little or no parking available. If you choose to travel by car you can travel on the A1 highway and change to the A30 getting out in Salerno. Or you can change to the A3 getting out at Vietri sul Mare, where the Amalfi Coast begins, and take the Amalfi Coast Road. This road is famous for its breathtaking views but is also narrow and heavily congested, especially in the summer season. Our expert wedding planners will be happy to assist you in organizing transfers to and from the Amalfi Coast, so that you can enjoy your wedding in Italy without worries!